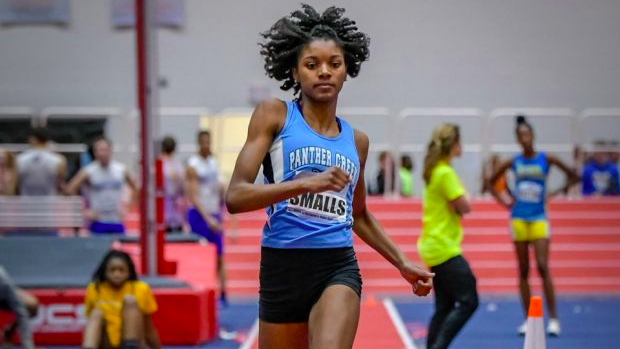 Morgan Smalls (Panther Creek) is going to need to score a lot of points with Panther Creek in the hunt at the NCHSAA 4A State Championship. She'll likely run in four events with three certainly being the High Jump, Triple Jump and Long Jump. Unfortunately, she'll have no cakewalk in either as she'll face an All-American caliber athlete in both events. In the High Jump she'll have a battle with Addie Renner (Myers Park). The two competed head to head in the AAU High Jump at the VA Showcase. Renner holds a best of 5-10 on the season, and jumped 5-8 just missing on three attempts at 5-10 at the VA Showcase. Smalls was able to take 2nd overall clearing 5-10 and just missing out on 6-0. Smalls tied the nation leading mark in the triple jump with a mark of 40-00 on Friday. Jirah Sidberry (Rocky River) didn't get a jump in on Friday, however she proved she'll be right there battling with Smalls after jumping a seasons best in the Long Jump of 19-2. Sidberry took 4th overall and earned a US#9 mark in the event. Smalls rivalry with these girls will be a big storyline of the team scores at the NCHSAA 4A State Championships in February.